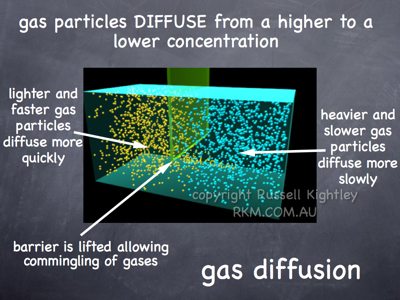 DIFFUSION: is when a gas (or other substances in solution) migrates by virtue of the inherent movement of its particles. This means that there is a net particulate flow from regions of high concentration to regions of low concentration. DIFFUSION SPEED: at a given temperature, the heavier species of particle will be moving more slowly and so will diffuse more slowly. Temperature is a measure of the kinetic energy of the particles and so heavier particles will move more slowly because their greater mass compensates for their lower speed. In this animation, the yellow particles in the left compartment are lighter and faster than the blue particles in the right compartment. When the barrier is lifted, the particles commingle but the lighter and faster yellow ones penetrate more quickly into the other compartment (i.e. they diffuse faster). Ultimately they will be thoroughly mixed but the animation stops short of this to show the difference in spread at the end frame. ENTROPY: diffusion leading to such a mixing of hitherto distinct species (and a concomitant drop in the concentration of each) results in an increase in entropy (or chaos). To reverse this process requires powered and selective pumps. Such pumps are common in biological systems and are used to create concentration gradients across membranes (for example). BUY THIS ANIMATION of diffusion!